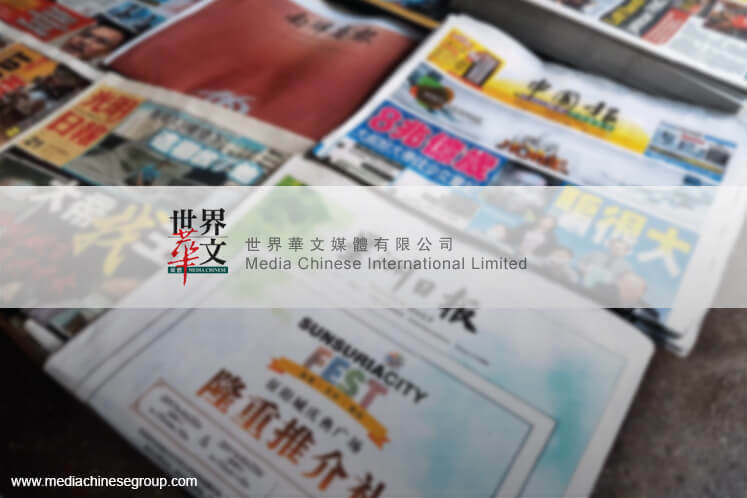 KUALA LUMPUR (May 29): Media Chinese International Ltd (MCIL), which publishes Sin Chew Daily, China Press, Nanyang Siang Pau and Guang Ming Daily, saw net profit drop 69.9% to RM3.66 million or 0.22 sen a share in the fourth financial quarter ended March 31, 2017 (4QFY17), from RM12.18 million or 0.71 sen a share a year ago, on lower revenue, negative currency impact and provisions for impairment of goodwill. Quarterly revenue also fell 12% to RM275.97 million in 4QFY17, from RM313.59 million in 4QFY16, on lower revenue from the publishing and printing segment, which fell by 14.9% year-on-year (y-o-y). Nevertheless, the Chinese-language media group declared a second interim dividend of 36 US cent (equivalent to 1.604 sen) per share for the financial year ended March 31, 2017 (FY7), payable on July 10. The weak fourth quarter earnings dragged net profit for the full year FY17 down 43.1% to RM67.04 million, from RM117.87 million in FY16, on the back of a 13.3% decline in revenue to RM1.34 billion, from RM1.54 billion. In a filing with Bursa Malaysia today, MCIL said its performance during the financial year was adversely affected by weak advertising expenditure sentiments in all its major markets as well as continuing migration of readers from print to digital formats. "Furthermore, the persistent weakness in the ringgit continued to weigh on the market sentiment and led to more cautious spending by advertisers. The continued security and safety concerns for travelling also affected the performance of the group’s travel segment," it added. Revenue from the group’s publishing and printing segment dropped by 12.5% year-on-year (y-o-y) to US$233.18 million in FY17, while segment pre-tax profit fell 36.3% y-o-y to US$23.45 million. "The group’s result for FY17 was also adversely affected by the provision for impairment of goodwill, which amounted to US$3.6 million. "Revenue of the travel segment for FY17 was US$69.41 million, a 16.1% y-o-y decline, while segment pre-tax profit was down by 60.6% y-o-y to US$2.46 million," said MCIL. For the coming financial year, MCIL group chief executive officer Francis Tiong said the group remains cautious about business conditions for the year ahead. "China is tightening its capital outflows policies, which may have adverse influence on the advertising and promotion budgets from advertisers, especially for the property and luxury industries in the Greater China region. "The US new administration’s policies may also trigger some negative influence on the trade and business conditions that affect the group’s North America operations. Furthermore, the potential for further substantial cost savings is likely to be limited, particularly after several rounds of cost-cutting exercises throughout the group,” he added. Tiong noted however, that the probable 14th General Election in Malaysia is expected to present favourable opportunities for advertising spending in 2017. "The media market in Hong Kong is also expected to show some improvement, driven by the 20th anniversary of the establishment of the Hong Kong Special Administrative Region. "In addition, the recent growth in the number of Mainland visitors to Hong Kong and the uptake in retail sales in March 2017 may also provide some boost to the advertising market,” he said. MCIL shares closed down one sen or 1.69% at 58 sen today, with 178,200 shares done, bringing it to a market capitalisation of RM978.6 million.